Many people might not know, Redfin two months ago increased their buyer agent commissions by 50% (now receiving 1.5% vs previously 1%). So I thought their 50% increase would be an interesting message to get out (few people know this, they just remember the headlines). But I also re-stumbled upon their “Real Estate Scie nce” blog post claiming that they ALSO did better negotiating vs an average Realtor. That is a pretty ballsy claim. I see why they felt they had to unleash “data” since their jealous competition was trying to dismiss them by saying: What you gain in rebate, you lose in negotiations. So their data proving they are better negotiators is great marketing, but it is just that, marketing. There is no scientific correlation to better negotiations (in my opinion). A larger % off list is not better negotiation. For example: I’ve often said, “I’d rather a buyer pay $12,000 over list on a property that is $50,000 underpriced, then negotiate $50,000 off on a home that is $100,000 overpriced.” See video on bank bidding wars. And recently I helped a client win an over list bidding war (6 buyers) and we were NOT the highest price. According to Redfin’s stats I didn’t do as good as an agent that got below list (regardless if that listing is overpriced). A.D.H.D. Sidenote: Also they don’t allow lowball offers. While I could use this as an opportunity to say “use us, we will submit your lowball” that would be a bait and switc h, since I actually don’t believe lowballs work (see video on lowballing). Why do I feel compelled to write this? Am I threatened? Nope, I just get asked a lot about them (like to match them, which I personally won’t), and this 3 hours to write post will save me the 34 minutes explaining why. I just send the link. I guess that is shellfish, but it lets me focus my time on saving clients a lower NET, and yes it takes actual human hours to do this. So what is wrong with their claim that they negotiate better (besides % off list not being a good indicator)? Seller Subsidy is also called Seller Paid Closing Costs, or Seller Contribution, where the seller will pay part of the closing costs (bottom line, the seller cares about their NET, but I highly recommend to MAXIMIZE this number as it makes your home close HIGHER, long story for a future post, make sure to subscribe to this blog). The result? A rebater, like Redfin, has to adjust their offer accordingly. The “Close Price” looks 1% lower in Home B vs Home A. So the major flaw in their data is Redfin is using the “Published Close Price” (Home B) NOT the NET closed price. I brought this to Redfin’s attention, and they told me that the areas that they calculated do not publish the seller subsidy on the MLS. How convenient. (note that Lane Bailey questioned this on Redfin’s blog months ago, with no reply, and minutes ago I found his post on it and more Redfin exposes). The Net is so important, that on FranklyMLS.com I barely show the Previous Close Price on listings (yeah we are the only MLS site in the DC area that has this data), FranklyMLS.com instead emphasizes the NET closed price after subsidy. So a super sharp consumer will say “AHA”! If you didn’t catch that, don’t worry. This stuff is tricky (I Pitty Da’ Fool) , and numbers can be easily warped and manipulated. (When anybody tells me their “team” is #1 at this office or that, I like to say that I was the “#1 Realtor in the USA, 30 and Under, in sales volume… in my First Year in the business“ a true statement, ask me for details though.). So back to Net to Seller, that is the point of my Realtor Rebates blog post, and for discount listings and For Sale By Owners go to my 2nd best post ever: Go FSBO! Save $20,000! Agent Tells All! Well with my previous post on % of list data . I showed the average agent getting about 1.5% off (talking closing price, NOT NET). Again, this is not a bashfest. I have recommended people for Redfin (mainly their great search engine), and they have very sharp Realtors that I have met personally. I Like Redfin. They are GREAT for the business and for my business. Shameless plug coming on. Turn away! Hurry! EARMUFFS!! If you are looking for average service, Redfin is better. We don’t offer Average service, here Excellence Comes Standard ™. Encore? Ok, here you go. Two bonus stories on Discounters. <!– 1) I sold a staged end unit townhouse (specific post coming soon, so SUBSCRIBE) that got bid up $10,000 with 4 offers (yes in 2008) that went for $75,000 higher than same sized interior unit ($40k nicer tops) two months earlier. So high we had to negotiate OUT the appraisal contingency (which isn’t easy!)! One of those bidders was Redfin (they actually had the cleanest/nicest visually, but not highest, written offer). That buyer tried to contact me directly. I sent them back to Redfin. Two weeks later, a neighbor with an end unit listed $15k higher (a very small community) than my unit closed for. I told my Redfin contact about it. (sidenote: is anybody still reading this? If so, if you follow my stuff, I got an A- in my Torts law school exam, end sidenote). He knew already since his buyer contacted him. I told the Redfin agent that there was a nearby sister community (technically a diff zip, so easy to miss) that just reset $75k lower since a Short sale closed. That community was now a MUCH BETTER DEAL. Unit 2 sold for $525,000. $10k OVER list with 4 offers in 4 days. FranklyRealty Listing. Unit 4 sold for $460,000 in 91 days. Analysis? I might be biased (which I am), but seems to me that some great marketing and staging helped get us $75k higher, then another unit listed and Redfin’s client bought it. Then another listing came on, and it went back down to $65k. “Advantage” Buyer (their client)? or Advantage Seller of Unit 2? Example 2) Another client had a horrible experience with an average Realtor (or maybe below average), so in the future they vowed to use a big rebator. Until they read my blog. Actually ALL of my blog (ask if you want me to send you the blog in book form). They read EACH post, even saying to me “I see you didn’t buy a Saab” which was in reference to the car buying post. They signed an Exclusive buyer agreement, see Exclusive Buyer Agency Contracts. Don’t Sign Them… Yet. over to another house. We were so aggressive and impersonal (long story on my stategy, heck I can’t put it ALL online, or the other agent will read it) that the seller felt the buyer didn’t want it as a “home.” Apparently I wasn’t warm and fuzzy, and this deal needed that. So, having never dealt with a no counter like this, I got creative. We wrote a warm and fuzzy letter. Including a photo of the buyers and about how much they loved the fountain in the back… stuff like that. They accepted the offer. No counter. About $10,000 to $15,000 below what my clients were willing to counter and about $50k below list. Few Realtors will take all that extra effort to fight for that last $15k. We do that. The End. Please report typos. Disclaimer: I might come off kinda cocky here. Sorry about that. I just love what I do and I get all worked up. I promise to be calm in real life, like a real person. Also make sure you subscribe to this blog (at the top of the blog). 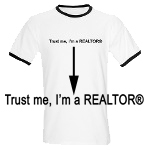 I have had several clients come to me to buy a home once they found it on Redfin’s site. Some have even asked me for the rebate. I explained why I don’t do rebates. I shared with them my numbers for deals that I have neogtiated and all of them have decided to work with me. Thanks Frank for the excellent analysis here. Based on your calculations, the Redfin agent gets less off on the Close Price (1 vs 1.5), less of a subsidy (.75 vs 1.5) and their only advantage is the rebate. So if non-Redfin agent gives just a .25 rebate, they will be just as good as a Redfin agent that won’t do a lot of the full service activities that add value to the transaction. Not sure why you are a fan of Redfin. Their business model is based on mis-leading advertising and below average service. Hey, Frank! Congrats on getting an A- on your Torts law school exam. Fab post. Glad to have assisted in your calculations. Well, I didn’t help you calculate, but I did negotiate an average seller subsidy of $8,103 for my buyers here in Winchester in 08.
a) their MLS search site rocks, so I gotta give them props for that. b) I like anybody that challenges the “tried and true” establishment. c) They give me an opportunity to explain better what I do. They make me better. d) They are high tech. I’ll take that any day over some “I just got a cellphone” Realtors. Or the “Sorry I don’t use email” Realtors, and yes they still exist. 1) You used 1.5% Redfin rebate in your calculations; the rebate was 2% during that priod. 2) You failed to mention that the rebate change from 2% to 1.5% (25% reduction as opposed to 50% increase in commission) was tied to increased service (free home tours now as opposed to before). 3) Your interaction with the Redfin agent disgusted me. I’m really glad you shared that. While Redfin Direct Agents may get paid salary, don’t overlook the fact that Redfin is a startup and its doors staying open is still tied to a % commission revenue model. The only thing I have to ask, is how do they provide this rebate? I just closed a deal with a Redfin buyer’s agent and the full 3% went to him and no where on the HUD was there a credit to the buyer from the agent…how’s that work? Hey Anonymous. Next time just use a fake name. Like Robert. Yep my numbers are all rough. 1) You used 1.5% Redfin rebate in your calculations; the rebate was 2% during that period. Frank> Yes, my "back of the envelope numbers" are for the current "total net savings". The main point was skipping seller subsidy was a huge error. Frank> Ok. I hear you. But doesn't a "50% increase in commission" headline sound better than "25% reduction in rebate." Both are correct. Their blog didn't say they were increasing their fees 50%, why? doesn't sound as good on the flip side headline. 3) Your interaction with the Redfin agent disgusted me. I'm really glad you shared that. While Redfin Direct Agents may get paid salary, don't overlook the fact that Redfin is a startup and its doors staying open is still tied to a % commission revenue model. Frank> Don't forget VC money also helps keep the doors open. Well it wasn't to disgust you. I debated putting that on here. But decided that it is just a different model. I'm not going to pull the "you get what you pay for" since some sucky agents will give no rebate and no service. Their model is different. The buyer does more work and their heads would explode if they were expected to research alternative neighborhoods for each and every tire kicker. Economics 101 precludes it. You only have so many hours in a day and if you are working with 7-8x the volume per agent (I forgot what 60 Minutes said) you have to allocate your hours wisely. The problem with buyers that want and think they can do it all themselves is a matter of you don't know what you don't know. Many people think Real Estate is a big scam. We are all swimming in cash! If it was… come join us. You'll see all the agents leaving the business. This stuff takes real hours and if we didn't offer real value… we would shrivel up. I try and give tons of info on my MLS site and this blog, but it is just a fraction of what I do. I told him (via live chat on the blog at 11pm) that to uncover the GEMS, put -Garage (which means no garage) and you will uncover poorly marketed listings that DO have garages, but were mismarked. The agent didn't check the garage box! He uncovered 3 homes that were bank owned and super low priced. That = Value. For him a lightbulb went off. "Wow, somebody that has done 100+ deals maybe, just maybe, might know a thing or two that might help me." Frank> Did you know the cheesiest real estate slogan contest winner's slogan was "Keeping it Real… Estate"
Keep questing my data. To disclose more… I liberally used Seattle stats for Redfin, and Va stats for the subsidy. I'd love Redfin to do a new study, but my data is raw. This type of data is worthless. If I help a buyer with a $400,000 property that is listed for $300,000 and we "win" it for $352,888 and beat out 12 agents, and I a BAD agent since my stats would show I helped a client overpay 20%? Gimme a break. Ok, I will stop talking now. Great point. They found a legal way to rebate the commission OUTSIDE the HUD1. Even though I have a letter fro HUD stating it has to be on the HUD1, they found a legal and creative way around this. My guess is they did this so that their VC funding and sales numbers look higher. $3,000,000 in Commissions and $2,000,000 in expenses (rebates)? The second option makes you look better. The real reason for doing this off the HUD1 … dunno, ask them. Thanks for tossing this back out there. I had questioned the accuracy of their conclusions on their corporate blog, as well as in one of my blogs back in March ’08, but had received no reply. While I don’t know the accuracy of your numbers, the point is certainly valid. And the larger point, one that is lost on many outside of real estate is that price and value are not always connected… in fact they are seldom connected. Getting more off list price doesn’t mean that the buyer got a better deal. It means that the buyer negotiated on a property that was over-priced. Keep up the “keeping everyone on top of their game”. It makes us all better. Whoa! Wait a minute, Frank…what do you mean a legal way to rebate the commission outside of the HUD1? I don’t know every single thing about loan origination, but I’m pretty sure there is no such legal way. Money exchanges hands that way all the time (not legal) and I even know agents and LOs who think it’s legal (nope), but it isn’t. Am I missing something? Is HUD mising something? I think it has something to do with a rebating of a “Professional Service.” And somehow that isn’t part of the home itself. I tried googling it, but couldn’t find it. I am very confident that a company which is constantly being challenged would have very good legal counsel to cross all Tees with their rebates. Lastly, the “legal” way around HUD disclosure is stupid. Anytime you’re finding a way around the law, you’ve already violated the spirit of it. If you’re on the up and up, then why not disclose it on the HUD? I read your blog quickly… I can see your point from a seller’s view but from a buyer’s view, why wouldn’t I use Redfin or i-agent, who gives you 2% back? If you are saying “low-ball” offers don’t work/Redfin won’t even put a low-ball offer out there and I offer the seller a certain amount under their list price, at least I will receive 1.5-2% back at the end. Seems as a buyer, this would be in my best interest since I will probably offer the same price on the same house regardless of whether I used an internet agent or a real realtor. Also, curious, in regards to your low-ball video… you make a good case for Arlington (heard it has held it’s value) but not too long ago you blogged that the sales of 1M+ houses have slowed drastically due to stocks plummeting. Would you recommend low-balling in the 1M+range just outside of Arlington? Matthew would be proud that you didn’t use Anonymous. Yes, you are right. All else equal, if a Realtor is just a paper pusher, sure why not get 1.5% to 2% back. The entire point of this blog (and all the posts) is the SLOW read. When you read slowly, I show you a fraction of the value. Sometimes it can be a simple “make sure you remove ‘garage’ from your search, as it might uncover bank properties that are mislabeled” Boom, there is $30,000 in value. Sometimes it is writing a letter to a seller that already said “no” and getting the seller to come down another $15,000. Boom, there is a Honda Civic for you. 1) Savvy and they think they know it all, and no stinking Realtor can create value. 2) More savvy buyer that can see that a good Realtor (not a sucky one) can add value. Better then a 10 minute call to Geico. I suspect that rebates to the buyer from the selling agent is legal outside of the HUD-1 because it is a division of the broker’s professional fee, which is allowed in Virginia and most other states. I suppose that one could require the disclosure on the HUD-1, but that would make too much sense. But that is ok. The point of the post is that numbers and averages like this don’t show much in terms of “good negotiator”. Frank, enjoyed reading your post. I’m example 2 in your post. That first house we didn’t win sat on the market for another 8 months after us (a total for over a year) and ended up closing at $10k less (not including subsidy) than the NET we offered them. HA! Anyways we ended up with a better home anyways thanks to your creative negotiating skills! Thanks again, you’re the best! The claim this post makes is not only not 100% scientific, it is, in our view, the opposite of the truth. Earlier this week, Redfin ran an analysis on every 2008 transaction in MRIS for Montgomery County, Fairfax County and Washington DC, excluding transactions where there was an obvious data-entry error (final prices 50% above or below list price; seller concessions that were greater than 15% of the final sale price). This approach is better than the one taken by Frank because it excludes seller subsidies that are the result of a typo, and because it takes into account every seller subsidy, not a sample of seller subsidies from one day or another. We compared the discount off list price negotiated by Redfin agents to the discount off list price negotiated by all other agents. Redfin negotiated a larger discount. We also calculated this discount net of any seller subsidies, for both Redfin agents and traditional agents, and Redfin still negotiated a larger discount. This negotiating advantage is over and above Redfin’s commission refund. As Matt Goyer explained in responding to your original comment on our blog, we never previously claimed a negotiating advantage in the Washington DC area because we had not been open for business in DC for a full year when we published the 2008 results. In every market that we did analyze, data on seller subsidies was not available. We acknowledged this as a weakness of the analysis of those markets. While our preliminary findings indicate that there is indeed a slight negotiating advantage for Redfin in the Washington DC area, we would prefer to publish these results in the context of the broader national report we prepare each April. By waiting, we can be more careful about which claims are statistically significant. Hope this helps to clarify the issue, though I doubt at this point anyone is still reading the comments on this post. People are reading (I hope). I look forward to seeing your report. Frank, you mentioned a net 0.25% advantage for Redfin and you used a 1.5% rebate to tally that number. The actual Redfin rebate during that period was 2.0% or 0.5% more than you used. Adding that 0.5% back gets to a net Redfin advantage of 0.75% or 3x what was originally calculated (also a 200% increase). I was just having some fun with the marketing spin. Hey Venturion (email me directly, I have a question for you). Thanks for questioning my data. You are right, and I was almost going to give you the “winner winner chicken dinner” award. How in the heck can you (meaning me, Frank) use Seattle area data, average Realtor negotiation ability (% off list) and throw that number in when comparing Virginia average Realtor negotiation ability (% off list). Those are apples and oranges. You can’t just cherry pick data points to make something look good. For example in some states it is normal to have a high % off list. It doesn’t mean that the entire state negotiates better, it is just different. Some places bid up a ton. For example I looked at bank properties in Price William county. Half of them went over list (conveniently for my current point, not counting subsidy). So my data, regardless of all the disclosures saying the numbers are rough, they are flawed. They are “correct” in one sense, but flawed in another. Redfin’s claim of being 1% better negotiators, while disclosing that it doesn’t count subsidies, in Seattle *might* be “correct” in one sense, but in my opinion is it flawed. I hope my message didn’t get lost. I will try to recap the guts. 2) Data is too easy to manipulate to be useful. For example, if your company doesn’t do bank properties or short sales, the data will be way off. Regardless of disclosures of missing data. For example, in theory, IF their data showed they were 10% worse… would they publish that data? Probably not. Thanks for your comment, but you could have done a better job busting me. So I thought I’d do it for you. I’m a bit surprised no one caught that….shame on us! I always remind people that real estate is local (or regional) yet I didn’t pick up on it either. Knocking 10% off list in S.Florida is almost expected. But in the DC area that’s almost a coup. Frank: u are my god. Thank u so much for explaining this all. I’ve forwarded ur blog for reading to a number of clients who all eventually see the light…or in this case the lack thereof:-) keep in blogging. Frank: Redfin makes sense for some people because some of the so called buyers’ agents are below average (I have first hand experience and heard from people who have first hand experience). So it makes a lot of sense to use Redfin (rather than these below average buyers’ agents. With a rebate, one is better off than using these below average (or even average) agents. A Superstar agent like you would not feel threatened by Redfin. But I think these average or below average buyers’ agents would feel threatened. I could be wrong, buy my impression is that if you are buying a house under $350k in this region, experienced agents would pass you along to a less experienced agents or average agents. I would be more than happy to have you as my agent if I know that I would not be assigned to a less experienced agent. Of course, this is only assumption on my part. It is unfortunate that real estate profession seems to attract some of these least “desirable” people, when in reality, this is a very important profession. It appears that some people think that anyone can be a real estate agent. Do not get me wrong, I think there are a lot of good ones out there if you are lucky enough to find them. I am glad that Redfin is here to provide an alternative to these agents (who really do no more than opening the doors, making phone calls, email you maybe or maybe not comparable salessubmitting offers). Thank you for all your wonderful blogs. Better than a 10 minute call to Geico — yes!! Husband and I are going over the pros/cons of buying and learning about the process, ideas like round-robins, what makes a great agent, etc, and we’re loving learning so much on your blog over the past couple of months! Sold a home to a buyer with a Redfin agent – what a nightmare!! This guy didn’t respond on time, bullied my agent and made this sale into a nightmare. All he cared about was his commission (making his customer happy) and clever fellow made ‘mistakes’ listed washer/dryer on contract that wasn’t on listing, we had to keep catching his ‘gotchas’. NIGHTMARE!!!! I will run away from this wacko company and their new ‘concept’ and I am guessing that traditional realtors won’t show Redfin listings because of the pain & suffering they put you through. The good news, my former neighbors know this couple that bought the house put us through pain – good luck with the warm welcome people! !